I had a cold for weeks and then my daughter caught it. We have really just been craving home-made soup. Since I saved the Turkey bones from Thanksgiving, I thought a big pot of Turkey, Veggies and Rice soup would hit the spot and help those sore throats feel better! 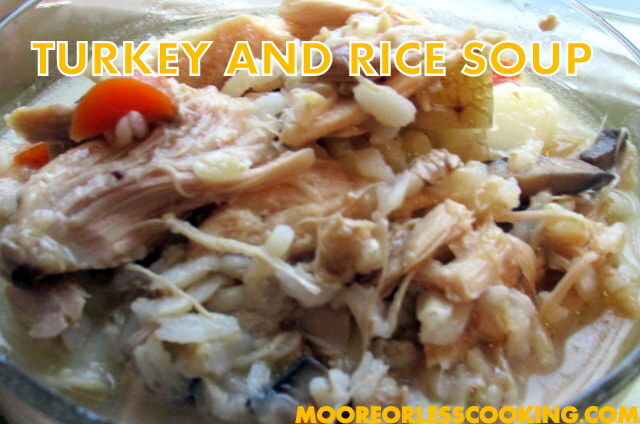 There are a few steps, but in the end you will be so happy to have a big bowl of hot Turkey and Rice Soup! This is an easy soup to make, there are some steps, but in the end you will have a big pot of delicious home- made soup! Nothing better than a bowl of hot soup with some Honey Cornbread Muffins! Place turkey carcass and sliced onion in large soup pot, cover with cold water. Bring to a boil, lower heat, let simmer for a couple of hours, until all turkey has fallen off the bones. Drain turkey and broth in a colander with bowl or pot underneath to catch broth. Let turkey cool, remove bones, use fingers if not hot. In a sauce pan, add Olive Oil, over medium heat, add onions, carrots and mushrooms, saute until veggies are soft. Take drained broth and vegetables and turkey and simmer on medium heat until potatoes are tender, add rice, serve hot. Add salt and pepper to taste. Oh YUM! I bet you do feel better. Hope to see this recipe at The Weekend Social tomorrow night. 🙂 Pinning! I just love everything about your soup and would to make it very soon! We will just love your Turkey and Rice Soup, it looks so comforting and I have just enough left over turkey to make it. Thanks so much for sharing with Full Plate Thursday this week. Hope you have a great weekend and come back soon! Thank you Miz Helen, enjoy this yummy soup! Thank you for the invitation, I will check it out!